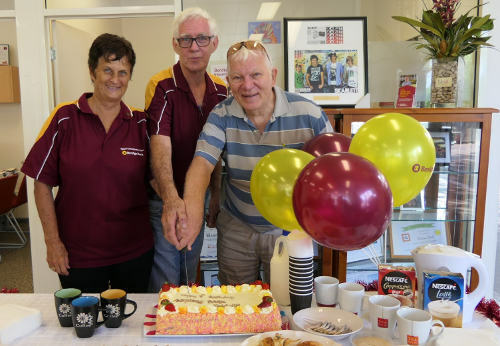 The Nightcliff Bank celebrates one year serving the Nightcliff, Coconut Grove and Rapid Creek area by returning profits to local community groups. Branch Manager Jeff Watson presented Nightcliff Cricket Club, SIDS 4 Kids NT, Autism NT and Camp Qality NT with donations as part of the first birthday celebrations. The bank is open Saturday mornings . Support the bank that supports your community. Local groups and charities have been invited to put their thoughts on how the bank should use available funds in the community. Many recently attended a community forum to discuss this, and local groups are invited to continue this discussion online. More than 300 Community Banks® have been opened around Australia with the aim of returning a percentage of profits to local communities. The Nightcliff Community Bank®.was officially opened by Austin Asche on 24th of September 2008. Local people and businesses now have a convenient location for all their banking, knowing that they are helping keep money within the district. This location will provide banking services to a wide area which had no banking services other than ATM's. Click here for more information on Community Banks®. The Nightcliff Community Bank®. is conveniently located to serve an area with no other local bank branches. Choice survey finds Bendigo Bank credit cards come up trumps against 20 other cards. Camp Quality staff and their puppets. Bank staff share a laugh with the Camp Quality staff and their puppets. The bank is proud to support the work Camp Quality does bringing optimism and happiness to the lives of children and families affected by cancer through fun therapy. 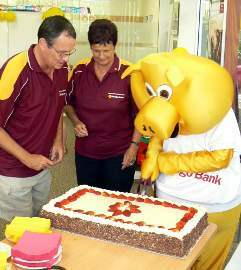 (left) Nightcliff Community Enterprises directors Gavan Keane and Lorraine help Bendigo Bank mascot "Piggy" cut the birthday cake. 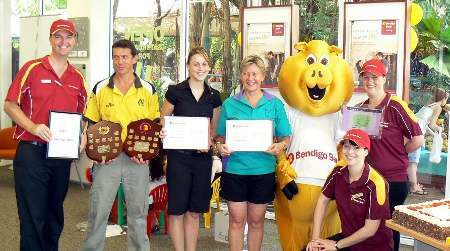 Nightcliff Bank is a 50/50 partnership between Bendigo Bank and Nightcliff Community Enterprises Limited, the public company formed by our community. The revenue is split 50/50 between Bendigo Bank and the community Company. At least 80% of the community Company Profits will be directed to community projects selected by the Company, with the remaining profits distributed to shareholders. Click here to return from Nightcliff Bank to Enjoy Darwin home page.